With other business assets, it goes without saying that timely checkups are necessary. The time is now to start treating your company website in that same vein. Most leads in today’s marketplace will originate online, specifically from Google searches performed on mobile devices. Problems with your website, even temporary ones, can hit you where it hurts, in the pocketbook. Google recently published tools for winning on mobile, including an impact calculator that estimates money lost due to slow loading pages. Call 800.231.4871 for website maintenance services. Usability has a major influence on website performance. This is especially true in the mobile-first era. One navigation issue, one user interface issue, can cost your business a month-changing lead. 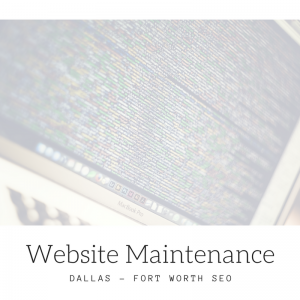 With a risk so great, investing in website maintenance services seems like a no-brainer. When you consider the inclusion of search engine optimization, website design, and social media management, it’s hard find a reason not to sign up for DFW SEO’s online marketing plan. You will never have to worry about your website again. A website is not unlike a home or vehicle in that failure to maintain it will cause problems both now and into the future. In fact, you’ll end up spending more money on issues down the line than you would on maintenance services. Loss of leads, loss of traffic, loss of search visibility, and loss of brand reputation are just some of the problems that can arise from lack of web maintenance. DFW SEO strongly advises that you not risk any of these problems because of their potential cost, not just to your website, but to your business as a whole. DFW SEO is the top internet marketing company in Dallas – Fort Worth, TX. We perform online marketing throughout DFW and that includes the design of a custom WordPress site along with its continual maintenance necessities. Our payment plans are month-by-month, freeing you from long-term agreements, and keeping us accountable at all times. We are so confident in our performance, that we’re willing to bet on ourselves and our results, each and every month. Take this no-risk proposition today by calling 800.231.4871 for website maintenance services. Updated on April 9, 2018 at 7:03 pm by Dallas / Fort Worth SEO.